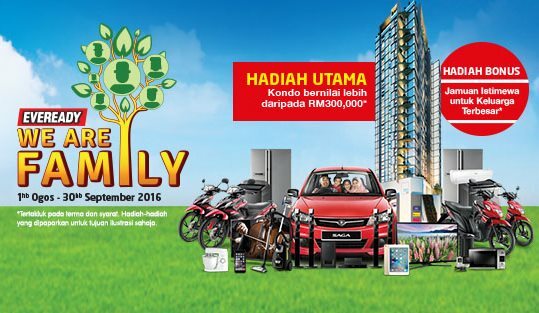 Home » car » GoPro » house » iPad mini » iphone » purchase » spend » travel contest » TV » vouchers » Aug1-Sep30: The Eveready We Are Family Contest: Win a Condo, Car, Family Holiday & more! Aug1-Sep30: The Eveready We Are Family Contest: Win a Condo, Car, Family Holiday & more! Family holiday voucher worth RM1,000 x 1. BonusPrize x 1: A ‘Kenduri’ for family and friends (up to 100 pax) worth up to a maximum of RM72,000.00. BUY a minimum of RM10 worth of Eveready/Energizer batteries in a single receipt. Create your family tree with a minimum of 2 names. You can Add/Edit your family tree until the closing date. Upload a photo of the original receipt and submit. Visit The Eveready We Are Family contest page for more details.